Our Gazebos come as 3m x 3m and 3m x 2m, and are good quality heavy duty models that are ideal for all types of events and shows. Our hire price includes delivery to site, erection and removal, all you have to do is tell us where you require them. This takes all the stress away from running an event, leaving the hard work to us. 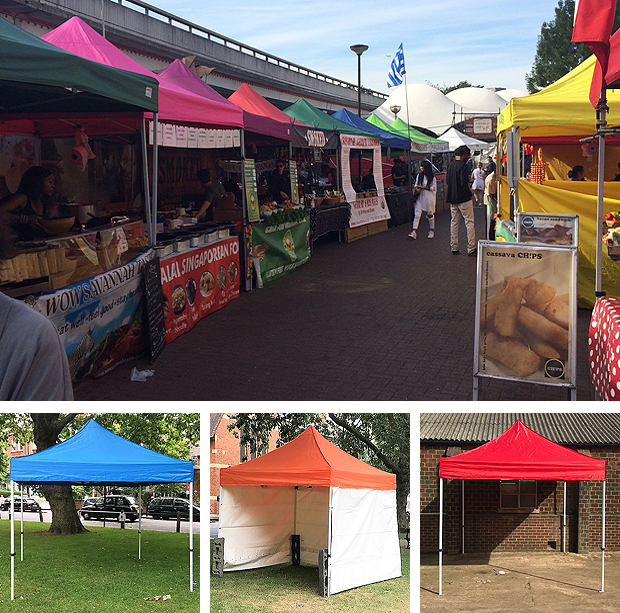 Gazebos are ideal for many events including Farmers Markets, School Fetes, Village Fetes, Charity Events, Town Fairs, Christmas Markets, Art Exhibitions, Sporting Events, Pride Events, Church Fetes. As you can see from the pictures left and below, they are very colourful and bright and are a good alternative to a show/event stall. Use the Contact Form or call 01268 697780 for more details and bookings.